As August Bank Holiday 2007 approached, I began to wonder if attending Sculptree and the Festival of the Tree was such a good idea. I had read all about the flooding and lack of running water in Gloucestershire and thought I might be wiser to stay in the East. However around mid-August everything changed. The West Country began to dry out and the South East turned gloomy, cold and wet, so eventually it was with some relief that we set off for Westonbirt. We left the rain behind around Reading and by the time we reached the Arboretum, we were enjoying sun and warmth. The chainsaw carvers had started work on the Monday before the Bank Holiday weekend so as soon as we arrived, I headed for the chainsaw carving arena and, even after so many visits, was amazed at the progress made in just three and a half days - in fact most of the sculptures seemed more advanced than usual. 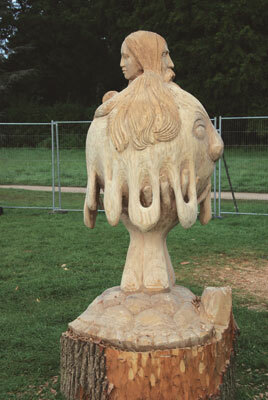 As reported in Woodcarving issue 99, Sculptree 2007 featured three newcomers to this annual chainsaw carving event. 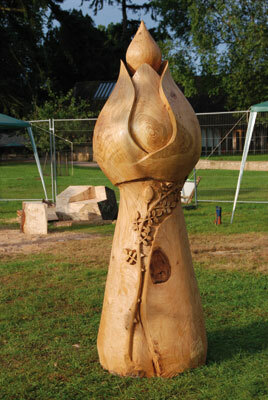 The other nine sculptors had all taken part in previous years, some in every Sculptree since it started in 1994. 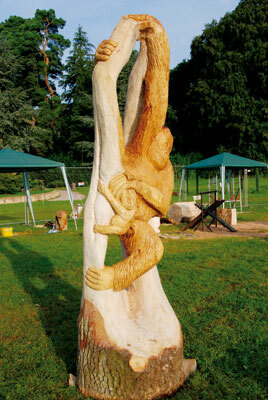 This year the theme was 'This Precious Earth' but each carver had put their own interpretation on it, resulting in the usual diverse display of sculptures. Paul Sivell was in the number one position, giving him the disadvantage of being first in the auction, which often results in lower bids while potential buyers are warming up, but making him the only carver lucky enough to be working in the shade. The Green Man in Paul's Fruits of the Earth was unusually inverted and had a little surprise of two magpies at the top. 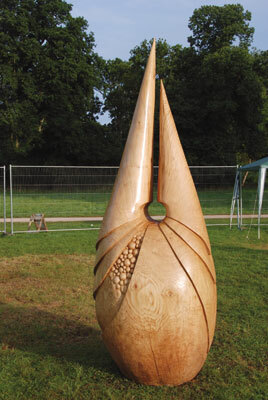 As it turned out, being first in the auction did Paul no harm as his oak (Quercus spp) sculpture was sold for a very respectable £3,000. While the sculptures this year had a certain elegance about them, I must confess to having preferences. 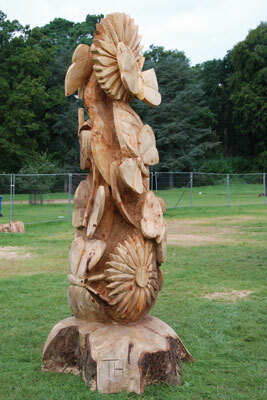 Dan Cordel's abstract Guardian would enhance any garden (especially mine!) and I did love the serene female face on Ed Harrison's Our Precious Earth. 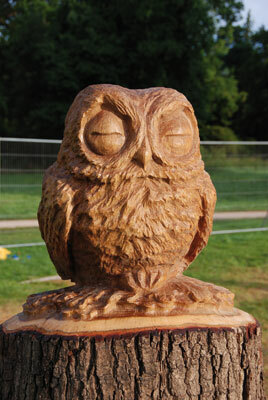 Most of the carvers managed to produce a small extra carving before the auction and Andrew Frost's Owl was just as much sought after as some of the larger sculptures, eventually attracting a bid of £1,500. 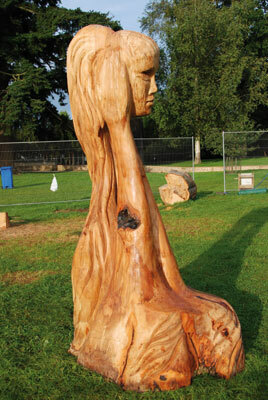 As well as the images on these pages, see Woodcarving 99 page 68 for Sculptree images from Gary Keenan, Nansi Hemming and John Wingfield. "The sculptures this year had a certain elegance about them"